How do I know if I have whiplash? The symptoms of whiplash may not always be obvious. 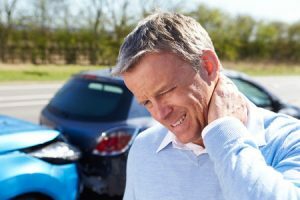 It’s important to understand what is whiplash to ensure you get the most effective whiplash treatment. Your doctor may advise physical therapy, painkillers, special stretches and exercises, or other treatments, depending upon the severity of your symptoms. Whiplash occurs when the head and neck are subjected to sudden excessive force, throwing the head backward and forward again. This may occur as the result of a car accident, a collision in a sport, or even a fall. The stress upon the critical structures of the neck and spine can cause small tears and inflammation in the muscles and structures of the neck, resulting in a loss of mobility, sometimes extreme pain, stiffness, nausea, and other symptoms of whiplash. The most common symptom of whiplash is pain- which can range from a mild “pins and needles” type sensation to extreme pain. The neck may feel unstable, and it may be difficult and/or painful to move your head. You may also experience shoulder and upper back pain, and headache. Some patients report a tingling and numbness that travels down the neck and into the shoulder and arm. It’s possible to also have a concussion or pinched nerve in addition to whiplash, which may complicate the diagnosis and treatment plan. For mild to moderate symptoms, there may be some options for self-care at home. Rest, over the counter medications, and ice alternating with heat may be appropriate. While immobilizing the neck and spine was once the recommended treatment, medical research has since proven that it is an ineffective whiplash treatment. Limiting mobility slows the healing process and may aggravate the condition. If you are having difficulty moving your head and neck, seek a doctor’s advice. You may be prescribed physical therapy, prescription pain killers, and even injections which may reduce the inflammation and speed the healing process.